Fred Olsen Balmoral – Xmas/New Year 2018/19 – Canaries All in all, this was a most enjoyable cruise and a great way to spend both the festive season and celebrate my husband’s birthday on Christmas Eve. This was our first time with “Fred”, although we’ve cruised a lot since getting the bug a decade ago. Compared with other lines, we were delighted that there was no constant hard sell, ship wide announcements were kept to an absolute minimum and queueing was practically non-existent. Of course the ship photographers were there as you ate at the gala dinners, but not always as you got on and off the ship - perhaps by the time we disembarked, they were on the excursions looking for material to go on the DVD. We always buy one and are looking forward to watching it on a snowy day – they’re really a great way to remember the cruise. One morning, I saw a photographer having breakfast, so took a photo of him, then told him it would be ready the next day! I thought it was funny, but have no idea what he must have really thought - he simply smiled very politely, then got on with his breakfast! Embarkation was truly straightforward, as was disembarkation (we cannot fathom why people sat on the stairs waiting to get off the ship when there were plenty of places to sit and wait). The only time we could have queued was at the Captain’s Receptions, but even then, we sat nattering to other passengers and waited until the queue had gone down. That really is the beauty of sailing on a smaller ship. I’ll get the one downside (British Night) out of the way so we can concentrate on how lovely everything else was. With the way politics are, perhaps something more neutral might be more appropriate. Why on earth would you travel abroad and bring that horrid jingoistic nonsense with you? We’re there to see the world and be ambassadors for our country, not to tell people we rule the waves! We were on second sitting, and rather tired that night, so watched the show from our cabin. We were astonished that the Boomtown Rats (Irish), Debbie Harry and Meatloaf (both US) were featured as the “Best of British”, not to mention Riverdance! And don’t get me started on the bit where they all dressed up as school children. Anyway, that was the low point of the cruise for us, and I’m sure other opinions are available. I made my own little protest by wearing a blue shirt with a yellow bow tie which surprisingly got some very positive comments from those who had cottoned on to the colours of a certain flag it resembled! I also wore a red, white and blue rosette (or was it perhaps bleu, blanc, rouge?) We bit our tongues on the “B” word and tried to forget that many of our fellow passengers had probably voted for the mess the country has found itself in. Such a shame, as we’ve never met such a friendly bunch on a cruise ship. It is sensible to steer very clear of any mention of politics, not wanting to ruin our holidays, nor anyone else’s! Anyway, before I lose you completely, let’s go back to all the positives, and that must start with the cruise highlight - the pantomime. This will be etched in our memories forever. It was definitely worth Andrew Robley (the Panto Dame) bringing 14 suitcases aboard, even though his mum was found clambering over them in her cabin! The theatre entertainment overall was a high standard and very enjoyable. Inside Cabin 4154 The cabin was small and the L-shaped layout of the beds made the best use of the space available, although the unit housing some drawers and the console for lights, announcements etc went behind one of the beds, just giving an extra shelf (which came in handy for my husband’s birthday cards to be displayed). The console itself had a button to turn off ship announcements, with a handy red light to let you know that one was being made. Our cases were on the very large side, so didn’t fit under the beds, especially as there was a wooden plinth in the middle. One case went in the wardrobe, the other between the chair and the bed. My husband has a habit of bringing extra coat hangers, not always necessary, but it’s not particularly a battle I care to fight. Thirty years together has taught me to agree to disagree, and if packing too many coat hangers is the worst thing, then we’re not doing badly! An extra couple of hangers might not have gone amiss, but he’d managed to pack over 30, so we had far too many! I’m sure they’d have brought us some extra, had we asked… The layout of the cabin meant one bed didn’t have a bedside lamp or table, which was a little bit disappointing – I suppose we could have asked for the bed to be made the other way round, so the drawer unit could be used. Being two men of a certain age, neither of us have much hair, so having not one but two hairdryers in the cabin made us laugh as did the fact that our Christmas crackers both contained combs! Daytime activities (especially after 5) are extremely low key (or non-existent), so we enjoyed the interactive TV’s on-demand film and TV programme options which we were very pleased to find came at no extra charge. The cabin was towards the back (I’m sure there’s a technical term for the blunt end), so when the ship was coming into port, the engine noise was fairly loud – and when moving in high winds, it did tend to creak, so earplugs are very much recommended. Having said this, for most of the trip, it wasn’t a problem. One cabin we would advise avoiding is 5143 – there was a really loud vibration noise outside, not sure if it was audible inside that cabin, though, but it would surprise me if not. We were delighted with the kettle in the cabin. Perhaps a little saucer for used teabags wouldn’t go amiss, but we used one of the glasses to put teabags in. We brought our own redbush teabags, but they were available in the tea station, along with a large selection of other teas and infusions. Our cabin stewardess came from Thailand and was very good and thorough. We didn’t get any towel animals, but perhaps, like the baked Alaska parade, also missing, that’s another thing of the past. We had a couple of very minor issues with the cabin (both of our own making). They were dealt with very speedily, with a short note afterwards to say they’d fixed the problem, but reminding us not to hesitate to get in touch if the problem hadn’t been rectified to our satisfaction, or if there was anything else they could do. A very nice touch, we thought. Dining – Table 301, Spey We’d asked for a table of 8, but were given a table of 6, but were only 5 diners – pleased to say we got on exceptionally well with our fellow travellers, three solo women. We were tucked into the corner by the door and it was very noisy at times, which apparently is unusual for the Spey. Being next to a serving station made it even noisier, cutlery and plates were thrown into bins by the waiters. Once we’d had a word with our servers it was better - we did this a couple of times during the cruise, simply saying that the noise levels had increased again. Had our table mates not been as brilliant as they were, we might well have asked to be moved. Service was impeccable – no problem with menu variations, for example having a starter as a dessert. With a couple of rare exceptions, we were very happy with everything we were served, although we did wonder why the rather tasty soup called borscht didn’t contain any beetroot! On the one night things really weren’t to our taste (the burnt nut roast incident), alternatives were found very quickly. We immensely enjoyed a late breakfast in the buffet sitting outside by the pool (heaters were on when it was cooler) – and rarely used the Ballindalloch main restaurant. One tip - for breakfast and lunch, all three restaurants have both a waiter served menu and a very similar buffet, but the menu items aren’t available in the main buffet. At breakfast, I very much liked the selection of nuts (Brazil, cashew and walnut) along with the goji berries. We didn’t partake of the sparkling wine at breakfast on formal nights, but I poured the orange juice into champagne flutes to give a sense of occasion! Much to my husband’s disgust (being on second sitting we’d not long had dinner), I liked to have a “look” at the midnight buffet, which was varied and certainly not at all leftovers from dinner! Needless to say, this “look” generally turned into something landing on a plate and into my mouth… Portions at dinner were on the meagre side - I’m sure double portions were available but we never asked - a couple of times we had two main courses, or an additional one to share. There’s no way anyone could go hungry! Christmas/New Year The ship was wonderfully decorated throughout and at guest services, we thought it was a lovely touch that you could help yourself to satsumas and nuts. Christmas Eve had a carol service after which port, sherry and mince pies were served in abundance. We got back to the cabin to find that instead of a chocolate on our pillows, we had a small bag of chocolates to share. Christmas Day had a deck party in the morning, with a free egg nog station, which helped things along rather nicely! Lunch was just a normal sea day – they actually forgot the lunch I’d ordered from a waiter – I asked several times over 30 minutes - but I did get a free glass of wine to compensate! I just thought it was hilarious as we were on an all inclusive package. But as they say, worse things happen at sea, and I certainly didn’t go hungry for long! In the afternoon, my husband had a sleep and I went to see the Queen’s speech which we all ended up listening to, as something was wrong with the technical setup. I very much applauded her sentiments against tribalism and the need to get on with ones neighbours, but bit my tongue! The entertainment team then played a game of charades, which was quite funny. We slept the rest of the afternoon until it was time to dress for the Captain’s reception. One of the entertainment guys was dressed up as Santa in the Captain’s parade on the way in, so I told him “all I wanted for Christmas is EU”, in quite a loud voice! It was Christmas, and I was well behaved for the most part! We thought our waiters seemed a bit rushed on Christmas Day, until we understood that they were all trying to synchronise and sing a few Christmas carols, which was another nice touch. We were very surprised to see that cocktail parties for certain loyalty level guests made up the main entertainment on Boxing Day, leaving very little to do for first time guests like us, or people who didn’t want to drink at 11am, but it did mean we got seats at the quiz, which was usually oversubscribed if you didn’t get there early enough. New Year’s Eve was great. There were two alternatives – one in case of rain, one for dry weather. The weather wasn’t too kind and we were glad to have brought rain ponchos with us which we put over our dinner suits. It’s a very comfy cruiseline and there isn’t any obvious stuffiness and pretentiousness we’ve found a couple of times on other lines. We were comfy and enjoying ourselves, so that’s what mattered! After dinner, we went to the show, then before we knew it, champagne (well, fizz) was flowing and the fireworks started which were absolutely fantastic and every bit as good as Sydney where we were lucky enough to see them on our honeymoon. One thing we didn’t hear, however, was a countdown, that’s not to say it didn’t happen. The festivities lasted long into the night and I knew it was time for bed when the conversation turned to football and all I could think to say on the subject was that some years ago, we’d really enjoyed seeing the Beverley Sisters – one of whom was married to a footballer. As I said, it was well and truly time for bed! I was very fragile the next day (one of the waiters even asked a couple of days later if I was still fragile! ), we finally surfaced and went to brunch in the Spey at around 11.45am, after watching the ex-policeman’s talk on airport security on our cabin telly. We were surprised that it wasn’t really a brunch, but breakfast simply morphed into lunch at mid-day. After lunch, we went back to the cabin and watched a great film called What I Did Last Summer. After paying a visit to the future cruise desk, we sat at the back of the ship with a cuppa watching the most magical sunset, in a nice warm spot thanks to the outdoor heaters. Ports We’d been to most of the ports before - and all of them were very easy to walk to from the ship, as long as you’re able bodied. None of the ship excursions took our fancy, but we were most impressed with the booklet and maps that came before the cruise, although they could have done with a little more information about the ports themselves. The destination guide, Graeme, did a good job of giving some hints and tips and not being too centred on the excursions. However, his appalling pronunciation of place names left a lot to be desired! As a linguist I picked up on this and his pronunciation would probably have confused local people if you were asking for directions. For some reason, exact docking timings weren’t given until the day before, which made it a little difficult to plan too much in advance, but having said that, we did seem to be in port for longer than other cruises we’d been on. Lisbon We did a Free Walking Tour (you just pay a tip at the end) of the Alfama and Mouraria districts – you can easily book in advance online – they did stipulate a €2 deposit for not showing up, but were very accommodating when I said we were on a cruise ship and it depended on the weather if we could dock. The tour was excellent, even though we’ve been to Lisbon countless times, and I’d even spent a month here in the 80s, we learned quite a lot from our guide. The tour ended near to the Church of Graça, where there is an amazing panorama of the city, along with a wonderful little outdoor café serving light snacks and sandwiches, the ideal antidote to the fancy meals we were having onboard. Las Palmas de Gran Canaria Our extended stay let us go a little further under our own steam. We went to Vegueta, the old town, on the number 12 bus for a couple of Euros, taking about 20 minutes. The architecture around the main shopping street, Triana, is beautiful and rather reminiscent of some parts of Old Havana. We visited the Museum of the Canaries which was a bit old fashioned and apart from a room full of skulls, not overly interesting. After a nice lunch, we went to the Christopher Columbus Museum (my Yorkshire upbringing and infantile humour still makes me giggle when I see the word “Colon”, his Spanish name)… It’s a fascinating place, with lots of old maps of how people thought the world looked, and housed in a beautiful old building. Highly recommended. After getting back, we still had time to go for a walk along the beach front and have a quick look around town, and even to the shopping centre by the port. One little tip – the port wifi reached into the ship, so on returning, I had a quick look at my emails, although we had taken advantage of free EU roaming earlier in the day. Gran Tarajal (Fuerteventura) It was too windy to dock, so we diverted to Puerto del Rosario, the capital. Not the prettiest of places, and with the exception of a very small museum dedicated to a philosopher who escaped from Franco and a shopping centre, we didn’t find too much to do here, so went back to the ship for lunch. Santa Cruz de Tenerife Once again, we were in port until very late evening, so we went by tram to the charming little town of La Laguna (the tram stop is called Trinidad and at the end of the line, making it very easy). After visiting a museum, we went for lunch at an old Canarian Restaurant (Patio Canario) which is housed in an old building. Far from being a tourist trap, most of the clientele were Spanish - the food and service were excellent, as were the prices. The tram ride cost a couple of Euros and was a very pleasant journey taking about 20 minutes. San Sebastian – La Gomera We hadn’t been here before, and I was intrigued that they have a whistling language, so was delighted to see that a local troupe do a demonstration of this, along with local dancing. Apart from that, we didn’t really find much else to do – we were only docked for the morning, so enjoyed a coffee in the main square with two of our table mates before heading back to lunch on the ship. Funchal - Madeira All aboard was 4.30pm which still left us time for a leisurely breakfast. With 11 cruise ships in port, we were very lucky to dock at the most convenient location possible. Funchal was understandably busy, and our attempt at visiting a Madeira wine lodge was thwarted by hoards of people. This was the only day where the weather was unkind with rain on and off, but we still managed to have a walk round. When it threw it down, we had a simple lunch (forgetting how large Portuguese portions were!) Walking round, we found parks wonderfully decorated for Christmas, and stopped by the lovely Christmas market, where we just had to have a ginjinha (cherry liqueur) in a chocolate cup, followed by a Madeira wine in a chocolate cup, then another just in case. And perhaps another, but I can’t really remember. We got back to the ship and slept it off until it was time for the Captain’s Reception and Gala New Year’s Eve dinner! La Coruña This is the one place I’d love to have spent some more time exploring. I’ve never really understood why you’d want to be off the ship for 8am when shops don’t tend to open until 10am or so, although if you’re on a tour to Santiago de Compostela, you would need to set off quite early to make it worthwhile. It’s a real shame we left La Coruña so early at 1.30pm as it was a lovely place for a wander around. We found a very quirky café and I enjoyed a black coffee while my husband had the most delicious thick hot chocolate. No wonder he didn’t have room for the midnight buffet! Walking round, it looked like there were a lot of interesting places for lunch which hopefully we’ll try next time. Ship activities We’d both been very busy before the cruise, so were very glad of time to relax. To be honest, we didn’t see too much of the daytime entertainment staff – there were no napkin folding/cookery demonstrations etc, but we did enjoy the talk with the dancers and singers explaining how things worked backstage. What daytime activities there were had a tendency to clash, for example the quizzes and the speakers. Most evenings there was very little to do after 5pm until dinner - that said, bridge players or dancers were probably very well served. That said, one night, there was a Mr & Mrs competition. We were going to join in, but by the time my husband said yes, we were pipped at the post by another couple. Probably just as well. Our meals meant that we missed the 10pm quiz, as it would have been too much of a rush to get to the theatre show afterwards. 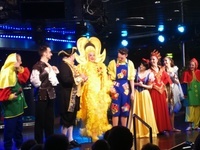 I’ve already mentioned Andrew Robley, who not only was brilliant as the Panto Dame, but also entertained us a few times during the cruise (both on and off the stage as he was around and about the ship quite a lot). There was also a comedian, a singer and a magician (to whom I joked that the passengers do a brilliant magic act – they can make food disappear at an amazing rate!) One thing we were surprised at was the suggested themes weren’t adopted by the waiting staff – we thought they should also wear a touch of red, tartan etc. We had a lovely and relaxing time and we’ve already put down a deposit on a future cruise, so that says it all, and we’d have no hesitation in recommending our cruise to the right demographic of mainly over 50s. It’s definitely more hip-op than hip-hop, Fred Olsen definitely know who their clientele is and look after them exceptionally well. The pantomime - absolutely brilliant! Of course the ship photographers were there as you ate at the gala dinners, but not always as you got on and off the ship - perhaps by the time we disembarked, they were on the excursions looking for material to go on the DVD. We always buy one and are looking forward to watching it on a snowy day – they’re really a great way to remember the cruise. One morning, I saw a photographer having breakfast, so took a photo of him, then told him it would be ready the next day! I thought it was funny, but have no idea what he must have really thought - he simply smiled very politely, then got on with his breakfast! Anyway, before I lose you completely, let’s go back to all the positives, and that must start with the cruise highlight - the pantomime. This will be etched in our memories forever. It was definitely worth Andrew Robley (the Panto Dame) bringing 14 suitcases aboard, even though his mum was found clambering over them in her cabin! The theatre entertainment overall was a high standard and very enjoyable. We’d asked for a table of 8, but were given a table of 6, but were only 5 diners – pleased to say we got on exceptionally well with our fellow travellers, three solo women. We were tucked into the corner by the door and it was very noisy at times, which apparently is unusual for the Spey. Being next to a serving station made it even noisier, cutlery and plates were thrown into bins by the waiters. Once we’d had a word with our servers it was better - we did this a couple of times during the cruise, simply saying that the noise levels had increased again. Had our table mates not been as brilliant as they were, we might well have asked to be moved. One tip - for breakfast and lunch, all three restaurants have both a waiter served menu and a very similar buffet, but the menu items aren’t available in the main buffet. At breakfast, I very much liked the selection of nuts (Brazil, cashew and walnut) along with the goji berries. We didn’t partake of the sparkling wine at breakfast on formal nights, but I poured the orange juice into champagne flutes to give a sense of occasion! Much to my husband’s disgust (being on second sitting we’d not long had dinner), I liked to have a “look” at the midnight buffet, which was varied and certainly not at all leftovers from dinner! Needless to say, this “look” generally turned into something landing on a plate and into my mouth… Portions at dinner were on the meagre side - I’m sure double portions were available but we never asked - a couple of times we had two main courses, or an additional one to share. There’s no way anyone could go hungry! Christmas Day had a deck party in the morning, with a free egg nog station, which helped things along rather nicely! Lunch was just a normal sea day – they actually forgot the lunch I’d ordered from a waiter – I asked several times over 30 minutes - but I did get a free glass of wine to compensate! I just thought it was hilarious as we were on an all inclusive package. But as they say, worse things happen at sea, and I certainly didn’t go hungry for long! We’d been to most of the ports before - and all of them were very easy to walk to from the ship, as long as you’re able bodied. None of the ship excursions took our fancy, but we were most impressed with the booklet and maps that came before the cruise, although they could have done with a little more information about the ports themselves. The destination guide, Graeme, did a good job of giving some hints and tips and not being too centred on the excursions. However, his appalling pronunciation of place names left a lot to be desired! As a linguist I picked up on this and his pronunciation would probably have confused local people if you were asking for directions. Once again, we were in port until very late evening, so we went by tram to the charming little town of La Laguna (the tram stop is called Trinidad and at the end of the line, making it very easy). After visiting a museum, we went for lunch at an old Canarian Restaurant (Patio Canario) which is housed in an old building. Far from being a tourist trap, most of the clientele were Spanish - the food and service were excellent, as were the prices. The tram ride cost a couple of Euros and was a very pleasant journey taking about 20 minutes. What daytime activities there were had a tendency to clash, for example the quizzes and the speakers. Most evenings there was very little to do after 5pm until dinner - that said, bridge players or dancers were probably very well served. That said, one night, there was a Mr & Mrs competition. We were going to join in, but by the time my husband said yes, we were pipped at the post by another couple. Probably just as well. Our meals meant that we missed the 10pm quiz, as it would have been too much of a rush to get to the theatre show afterwards. We’d love to have spent some more time exploring this port. I’ve never really understood why you’d want to be off the ship for 8am when shops don’t tend to open until 10am or so, although if you’re on a tour to Santiago de Compostela, you would need to set off quite early to make it worthwhile. It’s a real shame we left La Coruña so early at 1.30pm as it was a lovely place for a wander around. We found a very quirky café and I enjoyed a black coffee while my husband had the most delicious thick hot chocolate. We were in port until very late evening, so we went by tram to the charming little town of La Laguna (the tram stop is called Trinidad and at the end of the line, making it very easy). After visiting a museum, we went for lunch at an old Canarian Restaurant (Patio Canario) which is housed in an old building. Far from being a tourist trap, most of the clientele were Spanish - the food and service were excellent, as were the prices. The tram ride cost a couple of Euros and was a very pleasant journey taking about 20 minutes.